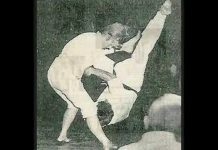 In 1957 Al Tracy and his brother, Jim, began studying Kenpo with Ed Parker and James Ibrao. 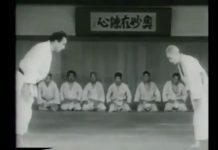 The Tracy brothers were promoted to Black Belt in 1962. Through their training, they had developed a close relationship with Mr. Parker the two began teaching his beginner and intermediate classes. Mr. Parker would travel back and forth to Hawaii, and soon the brothers were trusted to run his studio when he was traveling. 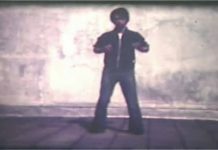 It was the Tracy brothers who created the the original belt manuals that, at the time, contained 40 techniques per belt. 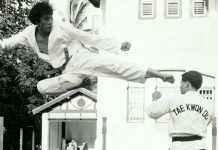 The brothers were the ones that gave the techniques names such as Attacking Circle, Raising the Staff, etc..
Ed Parker turned the Kenpo Karate Association of America (KKAA) over to the Tracy brothers and he then formed the International Kenpo Karate Association (IKKA). The Tracy brothers also joined the IKKA, but only after determining that they would continue to teach their own students to their standards. The Tracy brothers would later open schools throughout California and in other states, and they formed the Tracy’s International Studios of Self-Defense. By 1982, Ed Parker had changed what he called American Kenpo, so much so as to make it, in Parker’s own words, “no more than 10% Kenpo.” It was around this time that the Tracy’s decided that they wanted to continue to teach the original Kenpo they had learned from Ed Parker. 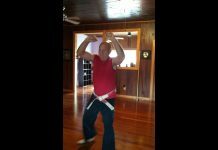 Al Tracy’s Kenpo Karate continues to teach “original” Kenpo today. Based out of Lexington, Kentucky, the Tracy’s International Studios of Self Defense is a organization with over 1,000 participating schools worldwide. It is the largest system of affiliated schools and the longest-running self-defense organization in the world. Grand Master Al Tracy organized The Gathering of Eagles in 1999. It is the largest gathering of Kenpo Karate members ever assembled. That first Gathering of Eagles was attended by over seventy masters, representing Kenpo, American Kenpo, Shaolin Kenpo, Nick Cerios Kenpo, Karazenpo Go Shinjutsu, Wun Hop Kuen Do, Lima Lama, Kajukenbo, and more. The event included some of the biggest names in the Kenpo Karate and Kajukenbo family of Black Belts. 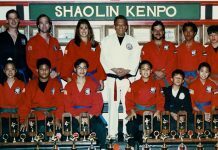 Grand Master Al Tracy was well respected and while he was alive, he was one of the few patriarchs within the Kenpo-Karate family. He is honored as an pioneer for the original Kenpo throughout the world and for his desire to bring together the community with the Gathering of Eagles. 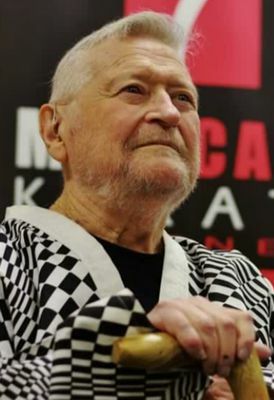 On October 31, 2017, Great Grandmaster Al Tracy passed away. He leaves behind a world filled with people who felt his love for the arts and for them. To help preserve and pass on over 800 years of history, traditions, legacy and the true lineage of Kenpo. Our heritage has been preserved and passed down by the senior members of the “Yudanshakai” to each new generation of “disciples”. The future of Kenpo is tied to our past. Kenpo’s senior leaders with their years of knowledge and experience form the bridge between the old and what appears to be new. Ours is a heritage of “Bushido”; the “warrior spirit” – that has been preserved for over 800 years. For over 22 generations Kenpo was the closely guarded Martial Art System of one family. That system is now our heritage. It’s not what you take or gain from the art of Kenpo that will endure, it’s what you give back. It’s who you teach and what you teach that will form your legacy. The family of Kenpo is no longer of just “one blood”, but it is still one family. We all come from a common heritage. Kenpo’s heritage has always been that of a true Martial Art System (Military Art) – (War Art!). This is an intangible that must be passed down from generation to generation! It has nothing to do with a belt rank or physical fighting ability. It has to do with “spirit”, “attitude” and what you have given back to the system! Where there is no “spirit” or if just one generation has lost it; there is nothing to pass on. Call it anything you like but it is not Kenpo. Motion becomes only motion, words become only words. Old Zen saying; the finger pointing to the moon is not the moon!